This is “Forex Equilibrium with the Rate of Return Diagram”, section 5.3 from the book Policy and Theory of International Finance (v. 1.0). For details on it (including licensing), click here. Use the rate of return plots to represent the interest rate parity equilibrium in the foreign exchange market. An alternative graphical approach is sometimes used to depict the equilibrium exchange rate in the foreign exchange (Forex) market. The graph is called the rate of return diagram since it depicts rates of return for assets in two separate countries as functions of the exchange rate. The equilibrium condition depicted in the diagram represents the interest rate parity condition. In effect, the diagram identifies the equilibrium exchange rate that must prevail to satisfy the interest rate parity condition. 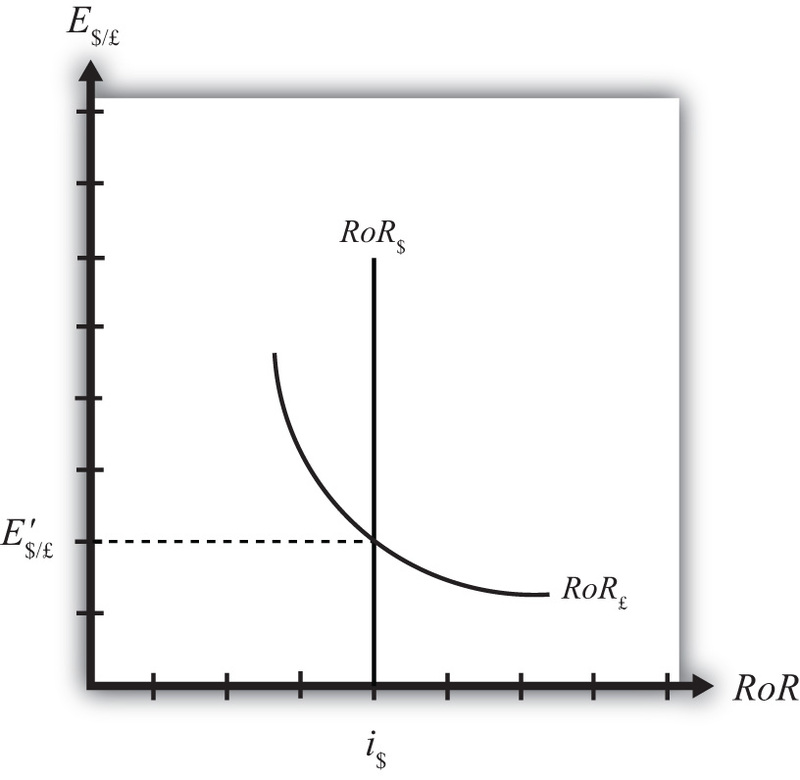 In Figure 5.5 "Rate of Return Diagram", we plot both RoR equations with respect to the exchange rate (E$/£). Since RoR$ is not a function (i.e., not dependent) on the exchange rate, it is drawn as a vertical line at the level of the U.S. interest rate (i$). This simply means that as the exchange rate rises or falls, the RoR$ always remains immutably fixed at the U.S. interest rate. The RoR£, however, is a function of the exchange rate. Indeed, the relationship is negative since E$/£ is in the denominator of the equation. This means that as E$/£ rises, RoR£ falls, and vice versa. Recall that the exchange rate ratio represents the expected percentage change in the value of the pound. Suppose, as an example, that this term were positive. That would mean the investor believes the pound will appreciate during the term of the investment. Furthermore, since it is an expected appreciation of the pound, it will add to the total rate of return on the British investment. Next, suppose the spot exchange rate (E$/£) rises today. Assuming ceteris paribus, as we always do in these exercises, the expected exchange rate remains fixed. That will mean the numerator of the exchange rate expression will fall in value, as will the value of the entire expression. The interpretation of this change is that the investor’s expected appreciation of the pound falls, which in turn lowers the overall rate of return. Hence, we get the negative relationship between the $/£ exchange rate and RoR£. The intersection of the two RoR curves in the diagram identifies the unique exchange rate E′$/£ that equalizes rates of return between the two countries. This exchange rate is in equilibrium because any deviations away from interest rate parity (IRP) will motivate changes in investor behavior and force the exchange back to the level necessary to achieve IRP. The equilibrium adjustment story is next. The rates of return are plotted with respect to the exchange rate. The domestic rate of return does not depend on the exchange rate and hence is drawn as a vertical line. The foreign rate of return is negatively related to the value of the foreign currency. The intersection of the rates of return identifies the exchange rate that satisfies the interest rate parity condition. Of positive, negative, or zero, the relationship between the U.S. interest rate and the rate of return on U.S. assets. Of positive, negative, or zero, the relationship between the exchange rate (E$/£) and the rate of return on U.S. assets. Of positive, negative, or zero, the relationship between the exchange rate (E$/£) and the rate of return on British assets. The name of the endogenous variable whose value is determined at the intersection of two rate of return curves.